The Power Steel™ Comfort Jet Oval Pool Set is a hydrotherapy innovation for above ground pools. As the name implies, the Comfort Jet has a two built-in water jets that provide soothing massage effect. This pool features another noteworthy feature, the outer pool walls are detailed cobblestone print. Enjoy the class and sophistication of actual stone, but at a fraction of cost. Frame &amp; Build The corrosion-resistant frame is easy to assemble with the trademarked Seal &amp; Lock System™ - each frame connection is guaranteed to be snug and secure. The sturdy outer walls are reinforced with Tritech™, a polyester mesh surrounded by durable PVC. This construction technique allows the pool to be stronger than traditional PVC while still being lightweight Accessories The Comfort Jet comes with a magnetic LED light that can be placed anywhere on the pool sidewalls. The light has seven different color modes and illuminates the pool beautifully at night. The built-in filter pump handles all filtration and circulation so pool water stays clean and sanitary. Special to the Comfort Jet pump, is the new antimicrobial filter cartridge. Relax and enjoy your pool while the antimicrobial cartridge tackles bacteria. The custom-engineered cartridge is tested to protect against staph infection, E. coli and more. The oval design and built-in flow control valve speed up the draining process. Just attach the valve (with included adapter) to a garden hose and begin draining. 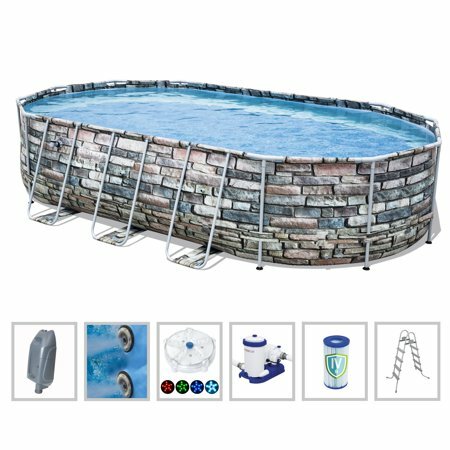 Along with the filter pump (with antimicrobial cartridge) and magnetic LED light, this pool sets comes with an underwater repair patch, safety ladder, pool cover and protective ground cloth. The Power Steel™ Comfort Jet Oval Pool Set is a hydrotherapy innovation for above ground pools. As the name implies, the Comfort Jet has a two built-in water jets that provide soothing massage effect. This pool features another noteworthy feature, the outer pool walls are detailed cobblestone print. Enjoy the class and sophistication of actual stone, but at a fraction of cost. Frame & Build The corrosion-resistant frame is easy to assemble with the trademarked Seal & Lock System™ - each frame connection is guaranteed to be snug and secure. The sturdy outer walls are reinforced with Tritech™, a polyester mesh surrounded by durable PVC. This construction technique allows the pool to be stronger than traditional PVC while still being lightweight Accessories The Comfort Jet comes with a magnetic LED light that can be placed anywhere on the pool sidewalls. The light has seven different color modes and illuminates the pool beautifully at night. The built-in filter pump handles all filtration and circulation so pool water stays clean and sanitary. Special to the Comfort Jet pump, is the new antimicrobial filter cartridge. Relax and enjoy your pool while the antimicrobial cartridge tackles bacteria. The custom-engineered cartridge is tested to protect against staph infection, E. coli and more. The oval design and built-in flow control valve speed up the draining process. Just attach the valve (with included adapter) to a garden hose and begin draining. Along with the filter pump (with antimicrobial cartridge) and magnetic LED light, this pool sets comes with an underwater repair patch, safety ladder, pool cover and protective ground cloth. The item included neither a groundcover or a pool cover as described. This was one of our deciding factors for purchasing this model and they were not included even though it was one the list of components. Also, I was not super impressed with the quality of the product for the price. The sides bowed in even after it was filled.